Welcome to Day #7 of Chocolate and Cacao Nibs Theme Week. 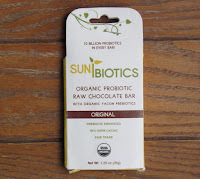 Today's Sunbiotics Organic Probiotic Raw Chocolate Bar was distributed by Windy City Organics (Northbrook, IL). The 65% cacao dark chocolate bar was just the right size for a single serving. It had a sweet and mild, authentic raw (un-roasted) chocolate flavor with a hint of vanilla bean marshmallow. 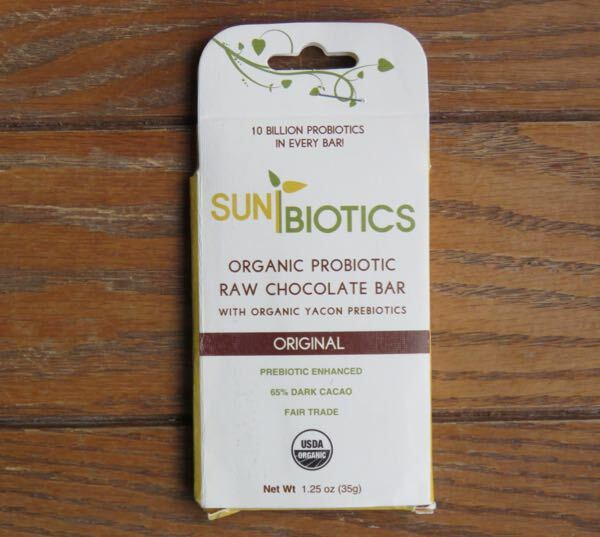 Even though this chocolate bar came loaded with "10 billion active probiotics," there was nothing different about the flavor. And if you didn't get enough "biotics," Yacon* root powder added some prebiotics. *Yacon is a plant that grows wild in parts of South America. It is grown for its edible root. The older/previous technical name for Yacon was Polymnia sonchifolia (Edible Goddess).